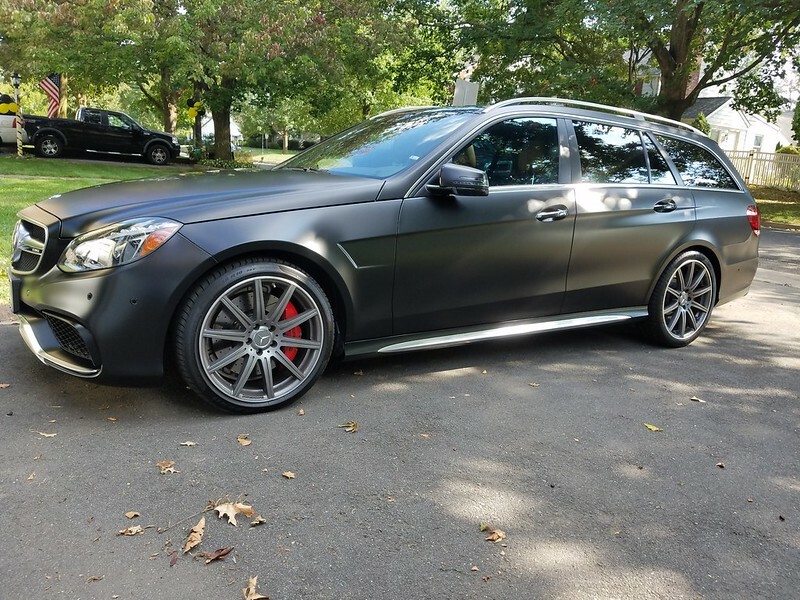 You might remember that we took delivery of our 2015 wagon back in August, a dream come true 1,300 miles of gentle use with all the right options! After getting a feel of the awesomeness and only being able to muster a 12.03 at the track it was time for a visit to the "HeartBreaker"
This is the first car that we have had custom dyno tuned, we have had plenty of STASIS, GIAC, and APR cars in our day but never a truly custom. To say that we were happy with the results is an understatement. We have 100% of the AMG drive-ability and reliability with the fun factor turned up to 11! With the recommendation of members here and the very watchful eye of Dave and Roshan at PowerHaus Performance it was time to dial her in and let the games begin (conservatively)! The plots speak for themselves....awesome! 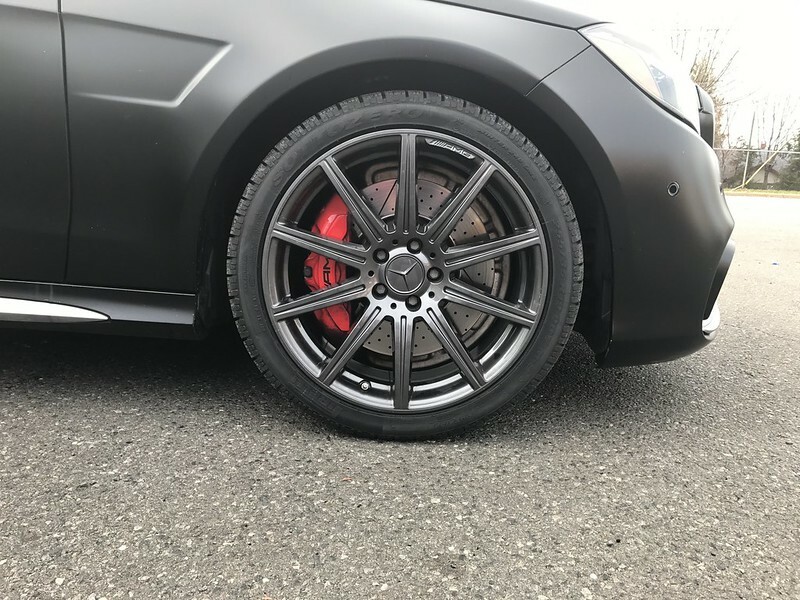 With the weather here in the NJ getting cooler it was time to start thinking about getting some winter wheels and tires. I saw a member here posted a set of stock take offs for sale and after what took way to long on my end of the transaction I had a winter wheels to play with! After a chance encounter I met the fellas at ACR Powder Coating right here in NJ. The pictures above are mid process but I am really liking how these wheels are turning out. 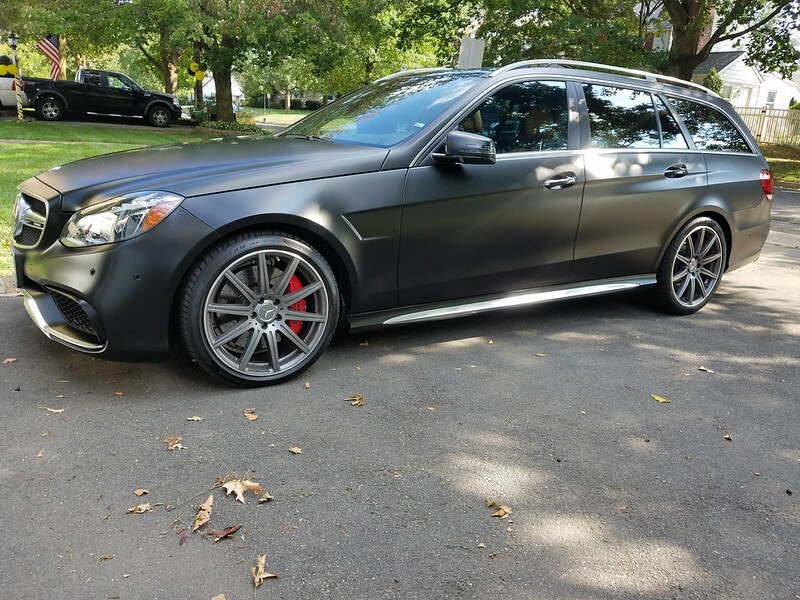 Its a Mercedes color that will go well with the matte black. The quality, service and price can not be beat at all! The wheels should be done tomorrow and then the Pirelli snow tires goes on for a few months. We have bigger plans for the car come spring and would like to keep all the updates in one thread! The next big question is what color do we paint or powder coat the summer wheels. Something distinctive and maybe, just maybe a little bit on the wilder side!! Last edited by Wickdwagon; 12-08-2016 at 08:52 PM. Well I did have some of my favorite blue marlin dredges in the cargo area they give us a definite performance advantage off the 1000 fathom line. But I have a feeling that they did not much to her gains in this case! Without a whole ton of other details I am not sure how to even draw a comparison. Tuning is a risk and we all mitigate that risk with different approaches. If you google enough you would never leave your house and live in a bubble. Last edited by Wickdwagon; 12-09-2016 at 02:54 PM. 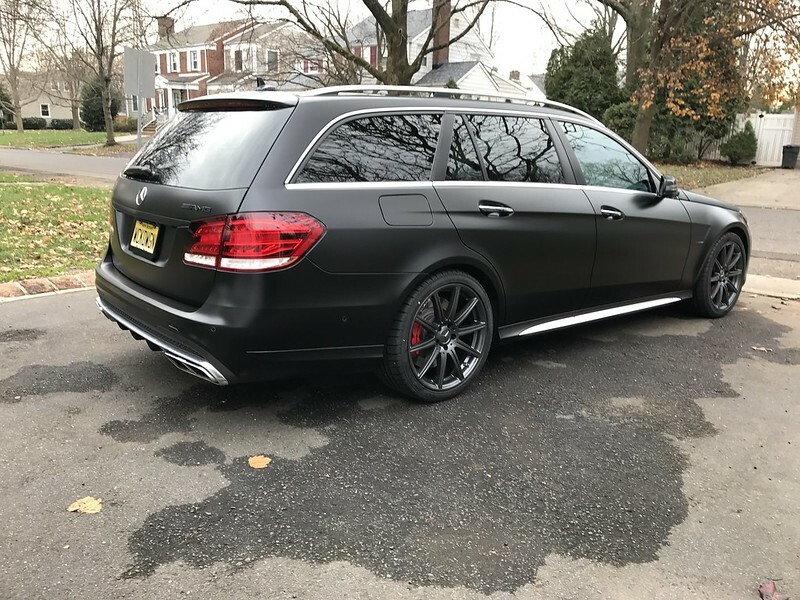 Oh and sick color on the wagon man congrats ! Thanks for the compliment. I have full trust in Dave and his team at Powerhaus. As Paul Harvey would say "And now the rest of the story". They have my trust, we have more work planned with them, I would rather not clutter the build thread a blind strafing of a reputable tuner is questionable at very least. I will surely do that....if not for the winter set, I will do it with the stock set that I am also going to have painted for the summers. That is a great point! Wheels are back and mounted. The fronts without tires but with sensors are 27.5# and the rears are an even 28#. 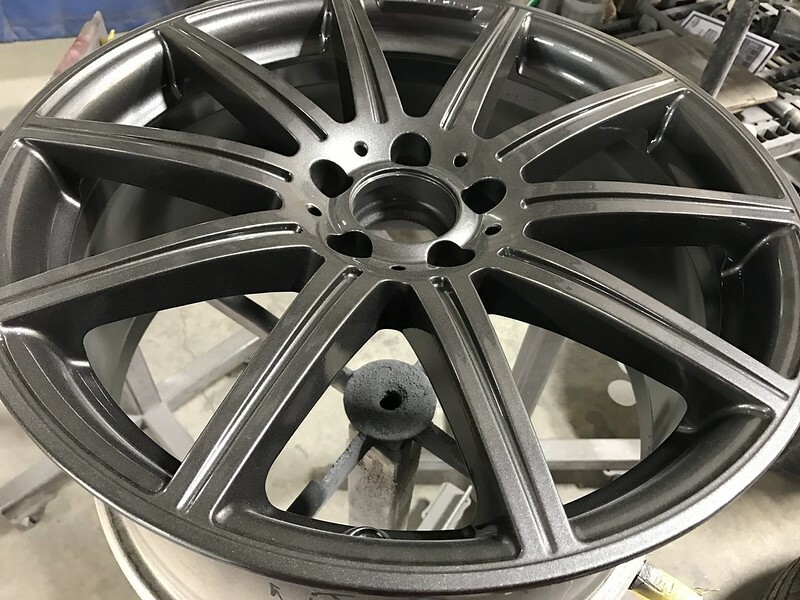 These were done by ACR Powder coating and I feel that they turned out amazing! Nice! Are you going to paint the exhaust/lower trim a la Night Package? No, I think that the side valences and the exhaust and the roof rails and the star in silver are a great contrast. I did not want to go for the totally murdered out look. I am looking to get the side badges painted the same color as the wheels. I believe that I am going to get the rear badges other than the star painted matte black. I really like the rear de-badged other than the star, but the sides bother me as the ident is meant to have something in it. Wheels are back and mounted. The fronts without tires but with sensors are 27.5# and the rears are an even 28#. The base color of the car is Obsidian Black, we have all our cars wrapped in Xpel Ultimate for paint protection. When we went to get this one done our guy suggested that using their Xpel Stealth would love sinister and unique but not boy-racer trashy. It turned out awesome! Thanks you to everyone here for answering so many questions. 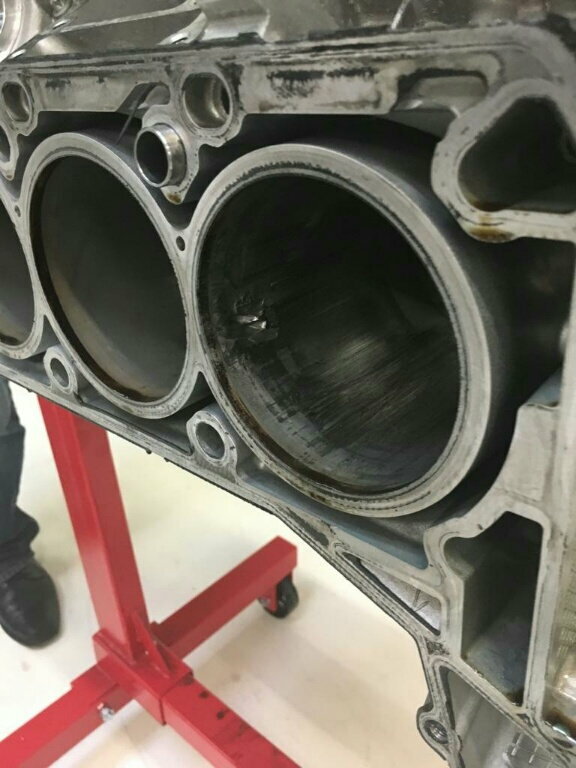 We were able to grab Fair Birds Weistec Turbo Back exhaust and all the trimmings so we are actually going to move that project up to ASAP, from a spring timeframe. Working with Dave and the team at powerhouse once again and until future notice they are our tuner and shop of choice! Going with the BMC drop in filters and expecting to have dyno plots of each step along the way. The original plan was to do suspension next, but sometime you have to call an audible! Now let's just hope they open some Giant Bluefin Tuna quota so we can pay for some more goodies! 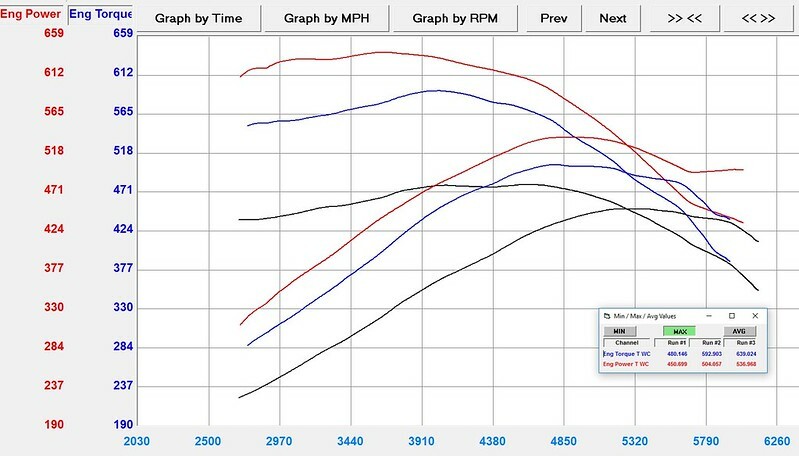 Stay tuned....I have tracking numbers, next will come dyno pulls!!! Pretty excited about this. Last edited by Wickdwagon; 12-23-2016 at 04:04 PM. I think same color as wrap would look nice. Otherwise would be a perfect space to place miniature Porsche crests, Audi rings and BMW roundels to represent all the kills you'll be racking up lol! The boys down at PowerHaus Performance have the wagon for round two are getting closer. This round is weistec exhaust, BMC filters and retune. She sure sound vicious. Excited to see where the final number end up in the AM. Good Golly Miss Molly Stage @ Complete!!! Could not be happier with the final results!!!! Once again Dave and Rashan knocked it out of the park!!! 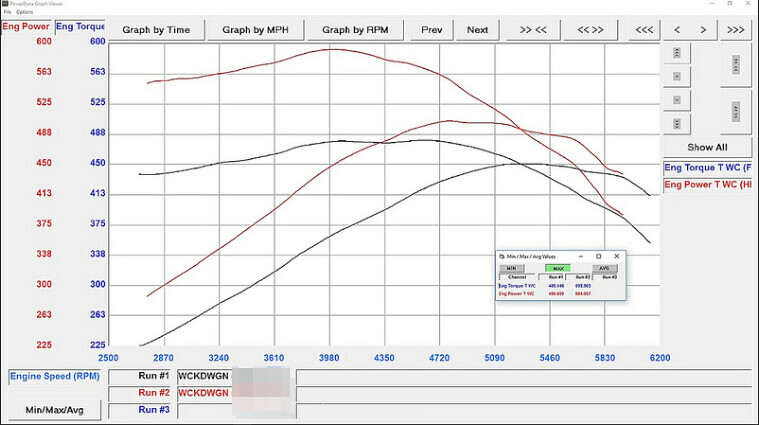 Mustang Dyno - Powerhaus Performance Tune, Weistec Turbo Back, BMC Filters. The sound is very impressive when you smash the pedal it becomes the "loud pedal" on command. Absolutely zero drone at cruising speeds, and 100% tame when you are not being a hooligan! Next steps.....hmmmmm.....not quite sure yet! What do you think those numbers translate to at the crank?